Alternative way to prepare tasty and rich sandwiches. To organize a party or an alternative dinner this is a right tip for you. 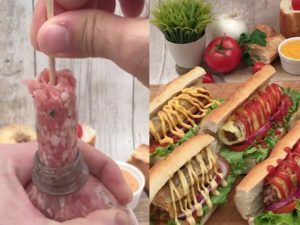 Using a plastic bottle you'll prepare perfect meat skewers to stuff the bread. Ingredients: 500 gr minced lamb; parsley; four spices; salt; black pepper; cheese slices; baguette; tomato; salad; sauces. Plastic bottle; a glass jar. Mini kebabs: how to make them with a bottle! 3 Ground Beef Dinner Ideas the Whole Family Will Love!